The WWE is a taking a major step forward with streaming content following the announcement of a new original series for Facebook Watch. 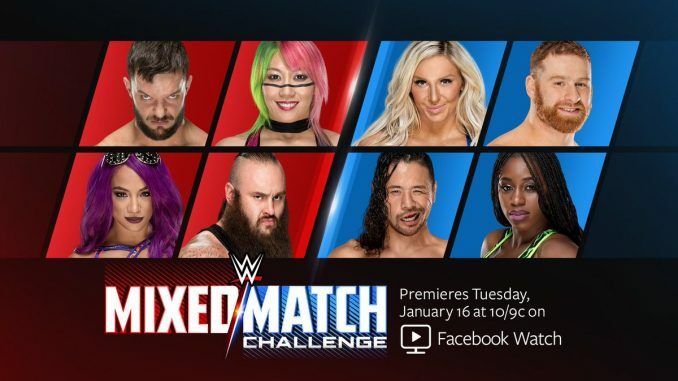 It was announced on Wednesday that the “Mixed Match Challenge” will premiere on the Facebook live streaming platform on Tuesday, January 16th at 10 pm Eastern. The 12-week series will feature mixed tag matches, consisting of male & female talent from both the Raw and SmackDown Live brands. The winning team will have $100,000 donated to the charity of their choosing. Teams will consist of one male and one female, however, they will be “mixed matches” as opposed to “intergender”, meaning that the matches will not consist of any male-on-female interaction. With the WWE’s domestic rights deal with NBC Universal set to expire in the fall of 2019, a short-term deal with Facebook adds a possible suitor for contract negotiations. If successful, “Mixed Match Challenge” is another card the WWE can bring to the negotiating table and beef up their domestic-rights package, which already includes: Raw, SmackDown Live and Total Divas. The announcement on Wednesday also coincides with first USA Network broadcast of the popular “NXT” series as they test the waters of the sub-brand on a major cable network. The logistics of introducing yet another first-run program will also stretch the demand of the main roster talent. The current schedule for a Raw talent consists of working Friday – Monday and this new deal will their extend their time on the road by another day with the addition of live Tuesday night matches for Facebook Watch. The status of “205 Live” is also unknown, which currently airs live on Tuesday nights at 10 pm Eastern on the WWE Network and will need to be moved from that timeslot to accommodate the new schedule. Facebook Watch launched this past August for Facebook users in the United States. POST Wrestling has yet to receive confirmation from the WWE if viewers in Canada and worldwide will have access to the new series.